Drain any excess grease, leaving hamburger in dutch oven. Drain cans of corn, beans, tomatoes, and olives into a 1 cup measuring cup. Pour this liquid into the dutch oven. If there is more than 1 cup of liquid, discard the excess. If there is less than 1 cup, top it off with water. If you prefer, just drain the vegetables and discard the liquid, and pour 1 cup of water into the dutch oven instead. Stir in taco seasoning mix. Simmer at about 225 degrees for 5 to 10 minutes. Pour hamburger mixture from dutch oven into a bowl. Spread 1/3 of the Fritos in bottom of dutch oven. Spread 1/2 of the meat mixture over the Fritos. Spread 1/2 of the corn, beans, and tomatoes over the meat. Spread another layer of Fritos, then meat, then corn, beans, and tomatoes. Spread last 1/3 of the Fritos on top. Spread olives over the Fritos. Bake at about 350 degrees for about 30 minutes. Check at 20 minutes to see if cheese is fully melted. 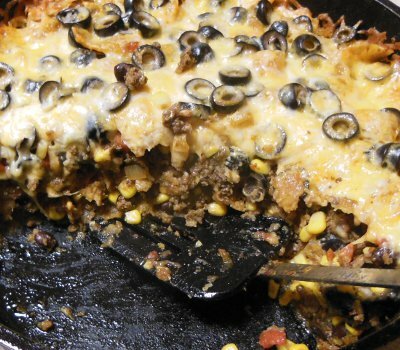 Let me know how you enjoyed your Frito Casserole! WE HAVE ANOTHER WINNER HERE! This was my 2nd item cooked in my DO and it went very well. The meal got thumbs up all around. Thanks! @Nick - This is my wife's favorite DO meal.